Last week I posted a teaser trailer posing a very important question…. Did I find a new Best Burger in CT. Some of you may remember when I took my trip to Pub 25 for an inside look at the building of my favorite burger in the state. Well, I was told that I had that right there, in the same town there was competition I had not tried yet. 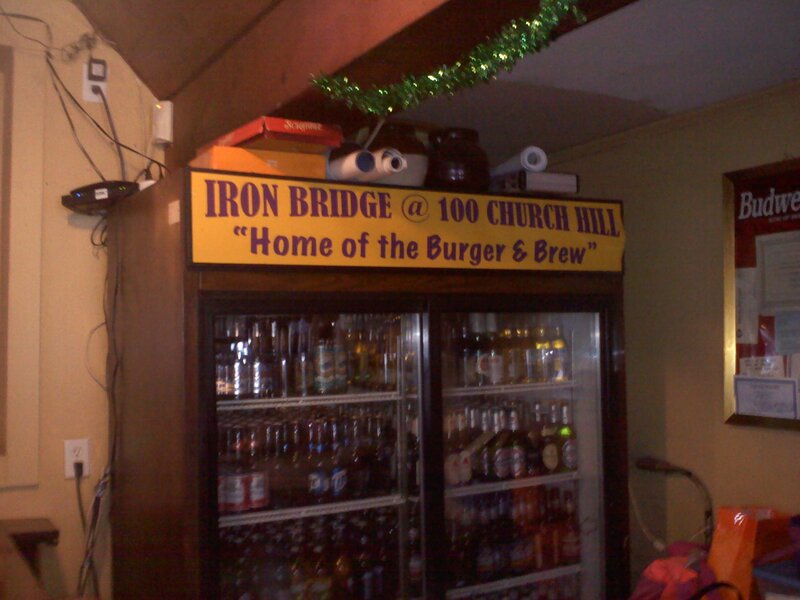 The “Home of the Burger & Brew”, The Iron Bridge @ 100 Church Hill. So, I took a trip to the Iron Bridge to try this Burger & Brew deal. First things first, if you are looking for a good deal, this is it. 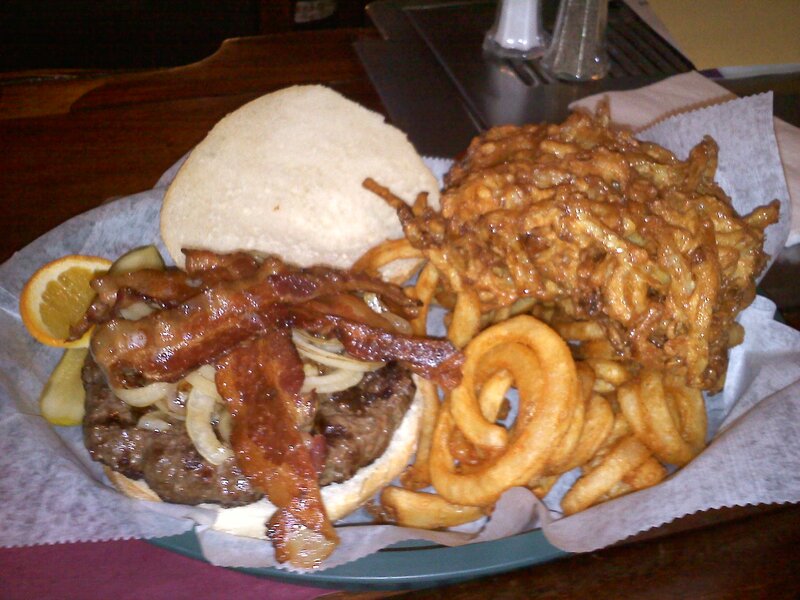 $9.49 gets you a 12 oz gigantic burger, curly fries, a fried onion brick, and a mug of draft beer. It is so much food, I could not finish it in one sitting after starting of my meal with the soup of the day, a sheet crab & corn bisque. 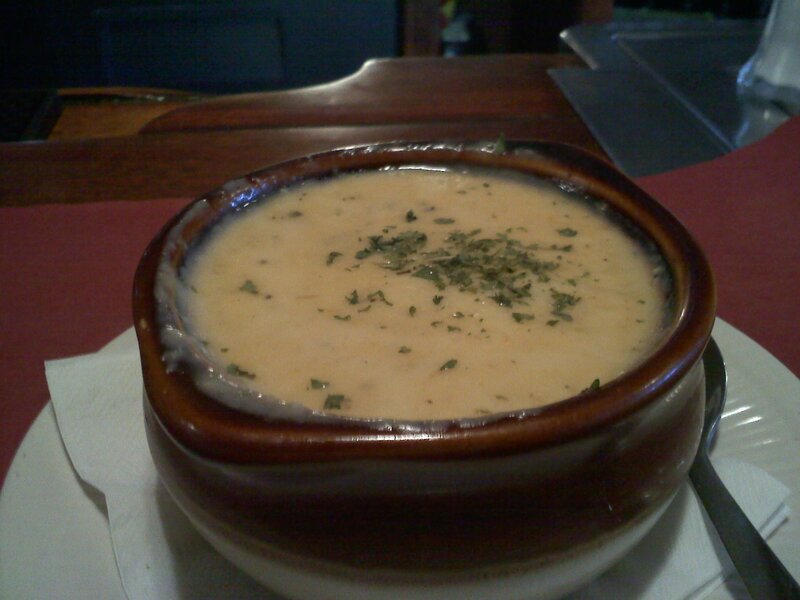 When Iron Bridge says “Soup of the Day”, you can tell they mean it” Fresh ingredients and made that day. With a little bit of Cajun flare, this bisque had great depth of flavor and just a bit of kick on the after taste. The owner Ray, told me they have one regular who lives all the way up in Hartford and makes the trip just to have this soup when it is on special. After my soup, I knew Pub 25 might actually have competition for its crown, so I took a trip into the kitchen to see where the magic was made. What did I find…? Topped with sauteed onions and bacon, by creation was complete. So first I had to go right for the burger. 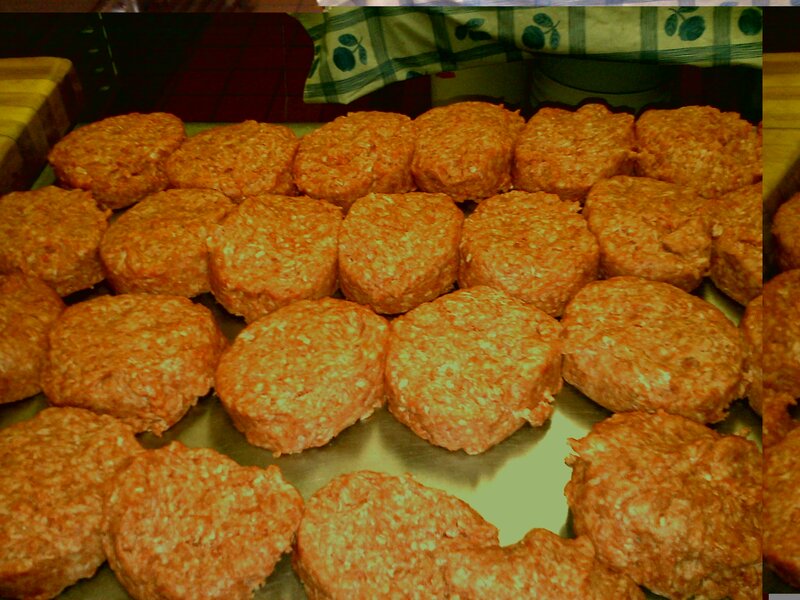 Juicy, well cooked… This is a great burger. Now, when it comes to burgers I have found there to be two major schools of thought. First, let the meat talk for itself… keep the seasoning light, and just make sure you use fresh, quality meat. This is what Iron Bridge does and they do it extremely well. I would liken this style of burger to the home of the original Hamburger Sandwich in the Country, right here in New Haven, CT… Louis Lunch. Very simple but very tasty. The second school of thought is to try and enhance the flavor of the meat with the right seasoning blend. Big, bold flavors that play with your taste buds. This is the style of the burger at Pub 25. So which is better? I will get to that in a little bit. First, back to this meal. As I mentioned, you also get curly fries (these were pretty standard, but perfectly cooked with a nice crunch but not overdone) and an Onion Brick. This onion brick, to me, was the highlight of the meal. Think crispy onion straws to the EXTREME! They take a bunch of very thinly sliced onions, dip them in a perfectly seasoned beer batter, and fry them together into a brick of unhealthy, fried goodness. Crispy on the outside, and nice flavorful onion on the inside, what makes this special is not only how well it is cooked or how well it is seasoned, but the fact that the batter does not overpower or hide the flavor of the onion. Over all, this was a fantastic meal. So now, onto the verdict… Did Iron Bridge take away the throne from Pub 25? Well… this all goes back to those two schools of burgers (see how I tied everything together), and my personal preference are those big, bold flavors offered by Pub 25. Just remember, this is a matter of opinion. Iron Bridge still offers a great product and is well worth your trip to try it for yourself and make your own decision. I know I will be back to try some of the other dishes I saw make their way out of the kitchen while I was there. While Iron Bridge may be “The Home of the Burger & Brew”, it is not the home of my favorite burger in CT. Pub 25 can keep that title…. for now.